while perusing tunes over on emusic, a great treasure trove of Indian music both filmi and classical. The voice is unmistakeably recognizable as Asha Bhonsle's and a quick search of the movie showed up exactly one hit on IMDB. This much I know about the movie - it stars Shashi Kapoor & Nanda. No one I know can tell me about it although some of my family said they remember it being a nice little 'time pass'. The ONLY synopsis that I have found (on three different websites) gives the story as Naina loves Sudhir on the sly, and is jealous of Sudhir's love for Neeta. When Sudhir does not reciprocate her love, she decides to create all kinds of misunderstandings for the two. Light-hearted romance with two popular numbers that still play on the radio and are also good to watch on TV. A little um, lacking, na? Good to see you back. Hope New Orleans didnt see much damage! Rootha Na Karo - The title (the most appropriate translation in this context is Do not Sulk!) says it all. Nanda's character (Neeta) sulks, pouts, whines and Shashi's character (Sudhir) coaxes her back into good humor (as only Shashi can)! Inspite of her serious lack of charms Sudhir seems to prefer Neeta to her more beautiful cousin Naina (Naaz) who also loves him. Naina manages to convince Neeta that Sudhir loves her only for her money (and who can blame the guy, if he does) and Sudhir finally decides to be the one to rootho-fy! There is a last-minute-rush-to-the-airport scene before everything ends happily. Apart from some forgettable comedy from Rajendra Nath and the most awesome songs, thats about all there is to the movie (yup its the pain of $6+insane amount of shipping talking here!). So, now you have another synopsis of the movie to add to your list! PS: You have put the same video in twice. 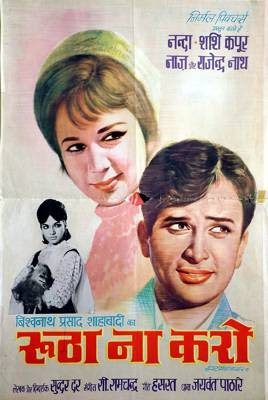 nanda is beautiful, any movie with Shashi kapoor is worth watching...I adore him. Bollyviewer - New Orleans did OK this time around and not sure it could take another one in the kisser like Katrina! Appreciate the review, looks like I will be just enjoying the songs for this one. Got the video fixed as well, thanks! ts - agree with you on both stars and yes, I am on facebook. Watching the second song on Youtube forced me to admit that I had fallen utterly and completely for Shashi's charme. So, I ordered the movie and hopefully it will arrive some time soon. Reviewer - didn't realize they were famous enough to be played on tv but thank goodness for youtube!